Like any proud dad, musical phenom DJ Khaled loves showing off his son, Asahd Tuck Khaled, who is about a year and a half old. Asahd is already so famous that his Instagram account has over 1.8 million followers. And recently, like most celebrity parents, his parents organizing the filing of applications with the U.S. Patent and Trademark Office ("USPTO") to register his name, and variants thereof, as trademarks. Because the USPTO charges filing fees per class, ATK Entertainment paid $5,775 in filing fees per application, or $17,325 total for all three (not including any fees paid to the law firm that filed the applications - Edell, Shapiro & Finnan, LLC in Gaithersburg, Maryland). Those fees top the approximately $12,000 Beyonce paid last June to file applications for the names of her twins. 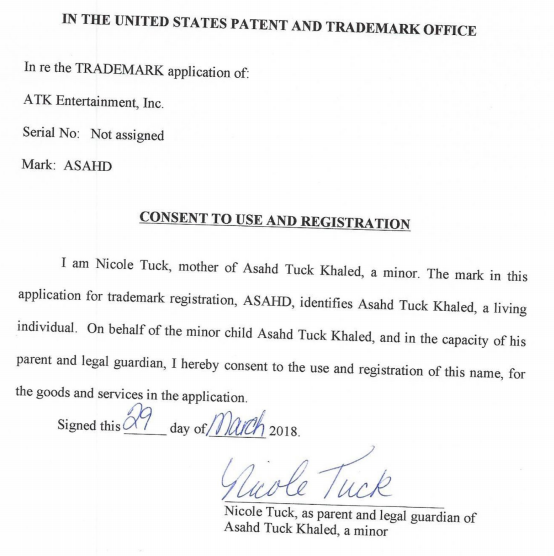 If you aren't convinced these applications are actually associated with the real Asahd Khaled, below is a written consent signed by Asahd's mother and DJ Khaled's wife - Nicole Tuck - consenting to the use and registration of Asahd's name as a trademark. A written consent was filed for each of the three applications. The written consent above is required because Section 2(c) of the Trademark Act prohibits the registration of a trademark consisting of or comprising a name, portrait, or signature identifying a particular living individual, except with that individual's (or in this case, their guardian's) written consent. Section 2(c) doesn't just apply to full names, but to nicknames, shortened names, pseudonyms, and stage names as well. TMEP 1206.01. 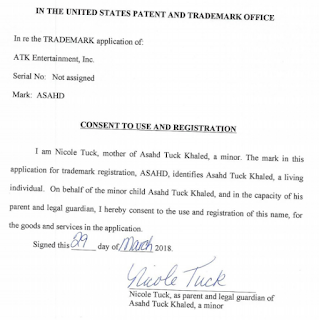 Before Asahd's trademarks can register, ATK Entertainment will need to start using his name as a trademark in conjunction with those goods and services listed in the applications and submit sufficient proof of same to the Trademark Office. In other words, don't be surprised if you see ASAHD cologne, or ASAHD jewelry, in the near future. According to my quick search, these are the first federal trademark applications filed by ATK Entertainment, Inc.
Do you know BOTUS? Aka Marlon Bundo, the Bunny of the United States, and the pet of Vice President Mike Pence's daughter? He's now the subject of two federal trademark applications. The Vice President's wife and daughter filed both application on an intent to use basis, suggesting they are not using these designations as trademarks in conjunction with all the goods listed in the applications, but have a bona fide intention to do so in the near future. 15 USC 1051(b); TMEP 806.01(b). 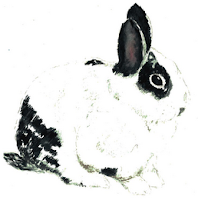 Before these applications can mature into registrations, Charlotte and Karen must start actually using the drawing above and the name MARLON BUNDO in commerce as trademarks and submit sufficient proof of same to the USPTO. TMEP 1103. The trademark applications follow the release of Charlotte and Karen Pence's new children's book featuring the bunny, entitled "Marlon Bundo's Day in the Life of the Vice President." John Oliver, host of HBO's "Last Week Tonight", parodied the book with his own version shortly after its release. According to my quick search, these are the first federal trademark applications filed by Charlotte or Karen Pence. To see Marlon for yourself, check out his Instagram page, which now boast over 32,000 followers.